Collector Plate Knowles Rebecca Sixth Issue Heirlooms and Lace Series. Home > Collector Plates > Edwin M. Knowles & Bradford Exchange Plates > Collector Plate Knowles Rebecca Sixth Issue Heirlooms and Lace Series. 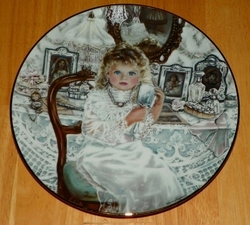 Collector Plate from Edwin M. Knowles, Titled Rebecca, plate six, designed by Corinne Layton from the six plate series Heirlooms and Lace series. Condition: Pre-owned, in as made condition, excellent for age, with no chips, cracks or crazing. Original box was trashed as it had water damage, plate put into a new plate box.